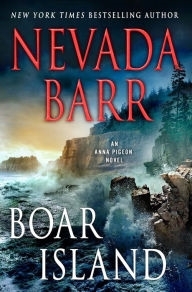 VJ Books Presents Author Nevada Barr! Nevada Barr was born March 1, 1952 in Yerington, Nevada. She grew up in Johnstonville, California, and finished college at the University of California, Irvine. With a master's degree in drama, she pursued a career in theater, TV, films, commercials and voice work for almost two decades. Barr created the Anna Pigeon series while working at her second seasonal job in Guadalupe Mountains National Park, Texas. Pigeon is a law enforcement ranger with the United States National Park Service. The books in the series take place in various national parks, where Pigeon solves murders that are often related to natural resource issues. Barr's first permanent Park Ranger job was on the Natchez Trace Parkway in Mississippi. She resigned to focus on writing when her books began to achieve commercial success. She currently resides in New Orleans with her husband. First Edition Hardcover Book 2009 NY: Vanguard Press First edition, first printing, mint, new/unread in flawless dust jacket. Each dust jacket is protected in an acid-free archival quality acetate cover. Author Signed Hardcover Book September 2009 NY: Vanguard Press First edition, first printing, mint, new/unread in a flawless dust jacket, signed by the author. Each dust jacket is protected in an acid-free archival quality acetate cover. Author Signed Hardcover Book 2001 NY: Putnam First edition, first printing, mint, new/unread, flawless dust jacket, signed by author. Each dust jacket is protected in an acid-free archival quality acetate cover. Author Signed Hardcover Book. May 2016 NY: St. Martin's Press First edition, first printing, mint, new/unread in a flawless dust jacket, signed by the author. Each dust jacket is protected in an acid-free archival quality acetate cover. Author Signed Hardcover Book April 2009 NY: Penguin First edition, first printing, mint, new/unread in a flawless dust jacket, signed by the author. Each dust jacket is protected in an acid-free archival quality acetate cover. Advance Reading Copy August 2010 NY: St. Martin's Press Advance reading copy, mint, new/unread in flawless pictorial wraps. Author Signed Hardcover Book August 2010 NY: St. Martin's Press First edition, first printing, mint, new/unread in a flawless dust jacket, signed by the author. Each dust jacket is protected in an acid-free archival quality acetate cover. Author Signed Hardcover Book April 2014 NY: Minotaur First edition, first printing, mint, new/unread in a flawless dust jacket, signed by author. Each dust jacket is protected in an acid-free archival quality acetate cover. Author Signed Hardcover Book 1997 NY: Putnam First edition, first printing, mint, new/unread, flawless dust jacket, signed by author. Each dust jacket is protected in an acid-free archival quality acetate cover. 2003 NY: Penguin Advance reading copy, mint, new/unread in pictorial wraps. Author Signed Hardcover Book 2003 NY: Penguin Putnam First edition, first printing, mint, new/unread, flawless dust jacket, signed by author. Each dust jacket is protected in an acid-free archival quality acetate cover. 2005 NY: Putnam First edition, first printing, mint, new/unread, Author Signed Hardcover Book flawless dust jacket, signed by author. Each dust jacket is protected in an acid-free archival quality acetate cover. Author Signed Hardcover Book 2004 NY: Putnam First edition, first printing, mint, new/unread in a flawless dust jacket, signed by the author. Each dust jacket is protected in an acid-free archival quality acetate cover. Author Signed Hardcover Book 2002 NY: Putnam First edition, first printing, mint, new/unread, flawless dust jacket, signed by author. Each dust jacket is protected in an acid-free archival quality acetate cover. Author Signed Hardcover Book 2002 NY: Putnam First edition, first printing, fine in a fine dust jacket, signed by author. Each dust jacket is protected in an acid-free archival quality acetate cover. Author Signed Hardcover Book 2002 NY: Putnam First edition, later printing, fine in a fine dust jacket, signed by the author, remainder marked. Each dust jacket is protected in an acid-free archival quality acetate cover. Author Signed Hardcover Book. 1995 NY: Putnam First edition, first printing, mint, new/unread in a flawless dust jacket, signed by the author. Each dust jacket is protected in an acid-free archival quality acetate cover. Author Signed Hardcover Book 1999 NY: Putnam First edition, first printing, mint, new/unread, flawless dust jacket, signed by author. Each dust jacket is protected in an acid-free archival quality acetate cover. Author Signed Hardcover Book January 2012 NY: Penguin Bookclub edition, first printing, mint, new/unread in a flawless dust jacket, signed by the author. Each dust jacket is protected in an acid-free archival quality acetate cover. Author Signed Hardcover Book January 2012 NY: Penguin First edition, first printing, mint, new/unread in a flawless dust jacket, signed by the author. Each dust jacket is protected in an acid-free archival quality acetate cover. Author Signed Hardcover Book January 2012 NY: Penguin First edition, first printing, fine in a fine dust jacket, signed by the author, remainder marked. Each dust jacket is protected in an acid-free archival quality acetate cover. First Edition Hardcover Book April 2008 NY: Penguin First edition, first printing, mint, new/unread in a flawless dust jacket. Each dust jacket is protected in an acid-free archival quality acetate cover. Author Signed Hardcover Book April 2008 NY: Penguin First edition, first printing, mint, new/unread in a flawless dust jacket, signed by the author. Each dust jacket is protected in an acid-free archival quality acetate cover.